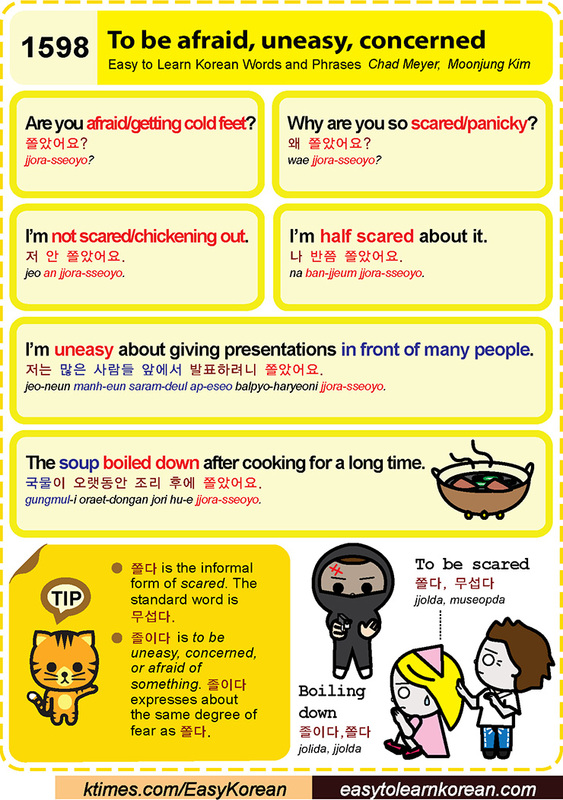 Easy to Learn Korean 1598 – To be afraid, uneasy. This entry was posted in Series and tagged Are you afraid/have cold feet?, boiling down, concerned, I’m half-scared about it., I’m not scared/chickening out., I’m uneasy about giving presentations in front of many people., or afraid of something, The soup boiled down after cooking for a long time., to be scared, uneasy, Why are you so scared/panicky?, 국물이 오랫동안 조리 후에 쫄았어요., 나 반쯤 쫄았어요., 무섭다, 왜 쫄았어요?, 저 안 쫄았어요., 저는 많은 사람들 앞에서 발표하려니 쫄았어요., 졸이다, 쫄다, 쫄았어요? by easykorean. Bookmark the permalink.